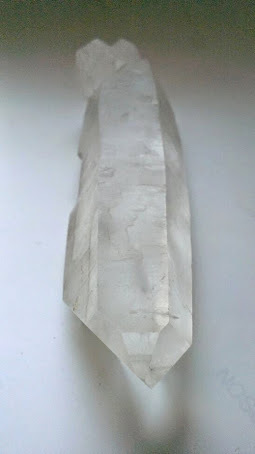 Dimensions: [L] 3.8" [W] 1"
Channeling crystals can be regonized by a large seven sided face in the front center of the crystal with the opposing back side manifesting a perfect triangle. Along with the triangle, there are usually other smaller crysatls projecting out of the back side. Numerological sing is 7 signifying 'The Student' 7 represents the intuition of the higher mind and the one who goes within to find wisdom. 7 detachment is obtained enabling 3rd eye vision. The 7 sided configuration signifies the opening doorway to which inner truth can be revealed. The 3 sided triangle on the back of the crystal allows for those thruths to verablly spoken. 3 represents the power of speech and the ability to creatively and joyously express. The powerful combination of the 7 takes the mind within to find wisdom. 3 enables that to be manifested and shared through the spoken word. The septagon represents the 7 qualities the human consciousness must attain in order to access and channel the wisdom of the soul, one of the virtues is balancing in harmony the 6 others, Love, Knowledge, freedom, manifestation, (the ability to project and create) Joy, peace and Unity. A channeling crystal is a line of communication with sources outside yourself. Generally, the main source is your guide. A guide is a non-physical entity whose primary job is to look after you. Every human being has a guide. Guides are sometimes called other things, such as conscience, or angels, but they are always with us. We must learn to listen to what they have to say. Your guide will never tell you what to do, or interfere in other ways with what you want to do, but your guide is there to help you find answers for yourself. And you can use your channeling crystal to let your guide be your conscience. A channeling crystal can only be used by the person holding it. In other words, you can't send the energy to someone else in order to let him receive the information directly. However, since guides communicate readily with each other, you can become good at getting information to people by asking your guide to give you the needed information for someone else, and then relaying it to the person. This is how you channel information for others. 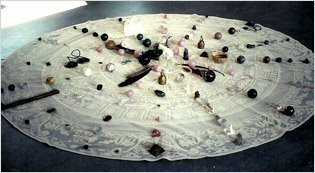 Channeling crystals amplify the quiet inner voice of your guide, and can be a big help in learning how to channel information, both for yourself and for others. Sit quietly holding the channeling crystal in your hand and focus on or consider the problem or area that you need help with. `Listen' carefully but remember that the answer might not come immediately. Often, in the beginning you may find that you wake up some morning and seem to `know' what to do. When you are working on a problem, keep the channeling crystal with you as much as possible and keep it close at night. Sometimes that is the only time the answers can come clearly when you are just starting to open yourself.